Pay attention. You might learn something. We look out on the landscape and we see what most people are eating out there. A lot of it is pre-packaged, processed fast food made in some factory far away. That's not the way we think people should eat. We think if you're going out to eat, you should get something you can't make yourself. We think people should eat honest comfort food they will drive out of their way to get. It starts with the dogs, naturally. We could just call up one of those big food service companies and order cases of God-knows-what or whatever else you can get in any grocery store, but what's the point in that? If you can make it at home, why come to the Super Duper? No. 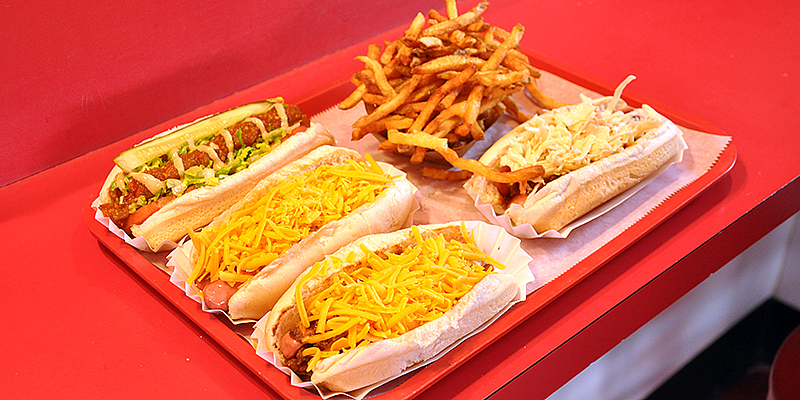 We spend a lot of time doing our homework trying to find just the right hot dog that balances perfectly with our homemade relishes and fresh, locally baked rolls. We don't just go and get the cheapest dog out there. If we won't eat it, we won't serve it. Did we say homemade relishes? You read that right. 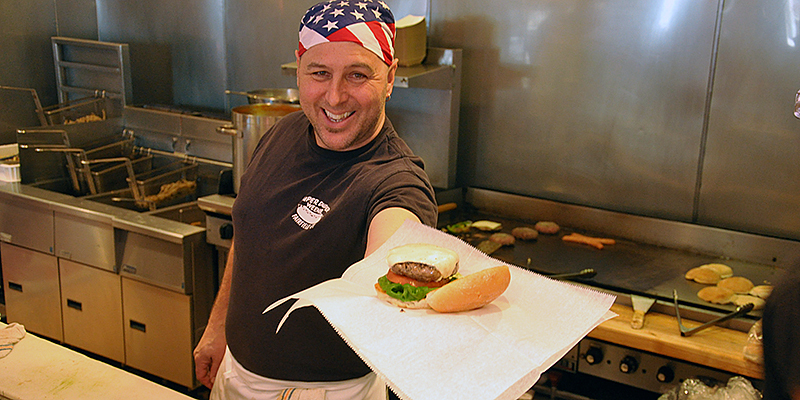 Ever since Gary first fired up the truck back in 1992, he went out there with his own recipe for a sweet and a hot that both get raves. Don't bother asking for the recipe, though. Not even our own mothers know that one. Now, let's talk French fries. If you think we work it to bring you the best dogs, you should see what we go through for our fries. We make Lorin drive all the way up to Western Massachusetts and bring back at least a thousand pounds of spuds, which we'll use up in less than two months! Then we store them with more attention than some places pay to their wine cellars. Heat, humidity, light... if you don't get it right, you don't get the best French fries on the planet. Like ours. Dogs, fries, homemade relishes, and now the Super Duper burger, a half-pound of all-natural, antibiotic-and-hormone free beef, grass-fed and grain-finished. 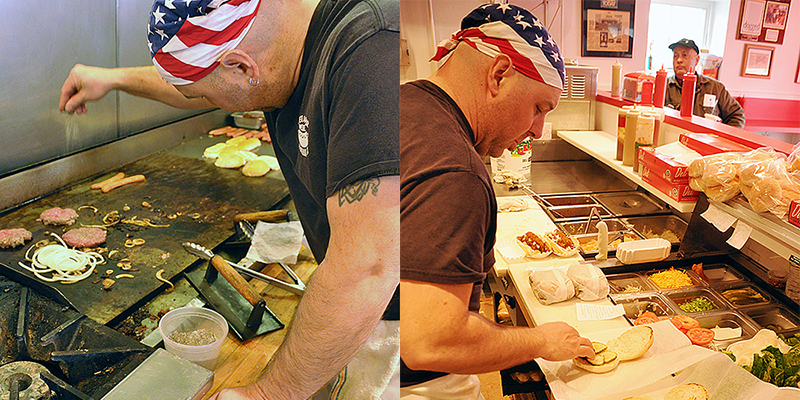 We get it from a local butcher and we grill to perfection in a 4 ounce and 6 ounce serving — cooked. Some people have told us that the burgers are so good, we should serve them for dessert. Holy... Almost forgot to mention the soups. Well, it's true that a while back when Gary was still just doing the truck, one of our customers craved our soup so badly, he broke into Gary's house to steal a pint (Don't get any ideas). When you make all your soups completely from scratch and with fresh ingredients, people can get a little crazy about them. Keep in mind that soups are seasonal. Don't expect any in the warmer months, but during the fall and winter, Gary might be brewing beef stew, curried sweet potato, tomato basil, beef barley, and on Fridays, one of the three chowders: Manhattan, New England, or Rhode Island. To wash it down, you can get the usual sodas, but we also offer the full line of Boylan's beverages. Root beer, cream soda, cherry... we got it. If you really want to top off the full Super Duper experience though, ask for a milk shake. You'll be spoiled for life.